I'm back! For MMGM, I am recommending Be Prepared by Vera Brosgol. I absolutely loved Brosgol's previous graphic novel, Anya's Ghost (see my review here), so I was extremely excited to see that she had a new one out! 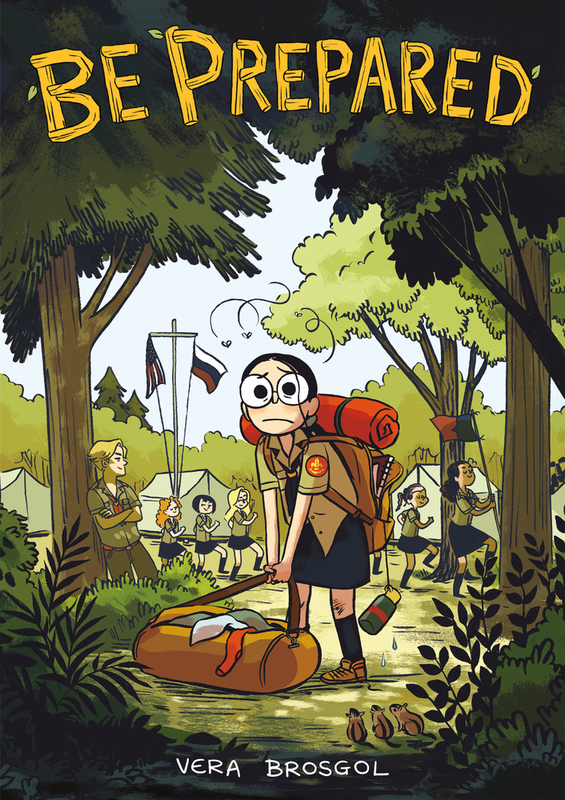 Be Prepared is a semi-memoir that chronicles 10-year-old Vera's experience at a Russian summer camp called ORRA. Initially, Vera is excited to find a place where she will not be the odd one because of her race and traditions, but the camp is not what she expected. Vera struggles with problems from being resented by fellow campers (whether by losing competitions or accidentally getting them in trouble) to being in a place without running water but with plenty of bitter, wild animals. However, Vera's determination (and some positives of camp, such as a friendly counselor named Natasha) help her make the best of her weeks at camp and maybe even have a little fun. I adored everything about this book, but one of my favorite parts about it was how compelling Vera herself is. Her misery makes you sympathetic toward her, but, despite making a couple of poor choices, she never dwells too much on her sadness and makes for a character you'll root for throughout the book. Another great part of the book is the art. Like Anya's Ghost, Be Prepared is drawn in a three-color style (this time green, black, and white) which gives the book as a whole a unique personality. Each drawing still manages to convey immense emotion, however, helping to draw readers in. Finally, I loved how the novel depicts what it is like to feel out of place due to factors such as race, money, age, and more. Almost every reader will relate to at least one of these themes. All in all, Be Prepared is an enormously enjoyable graphic novel that will elicit laughter, pain, joy, and awe from readers of all ages and personalities!